Draft preview: What do scouts look for in an NHL prospect? What are NHL scouts looking for when they watch the next generation of talent? Three scouts detail what information they gather before the NHL draft. It doesn’t take any special training to watch 17-year-old sensation Connor McDavid blow past a pair of hapless defenders and recognize that he’s on the verge of being something special. But determining whether fringe prospects like Tri-City left winger Matthew Freytag or Saint John right winger Mathieu Joseph have what it takes? That requires a more nuanced understanding of the game and what it takes to succeed as a pro. The process of scouting underagers is far more complex than it was even a decade ago, accounting both for the sprawl of the game to more far-flung locales and the availability of enhanced information-gathering techniques ranging from video to the use of advanced statistics—although to be fair, the uneven collection of information across the various feeder leagues at this point in time means the numbers game is still in the lamppost phase. But even as the access to information improves, the scouting game still relies heavily on in-person viewings and the special knowledge of an experienced bird dog. Skating: The pro game is faster than ever. If a prospect is going to succeed, he has to be able to keep up. “The ability to play at a high pace can be the difference between a career in the NHL and riding the buses,” one scout said. It’s not just flat-out speed they’re looking for either, although that’s important. They also key in on acceleration, lateral mobility, a quick first step and balance. Plenty of players read and react well to offensive chances, but scouts prize the ones who can make the proper decisions in all three zones. Competitiveness: One scout says there’s nothing that will make him dismiss a prospect as quickly as a lack of competitive fire. “You want a player who is motivated, who wants to make something out of every shift,” the scout told SI.com. “A player who will go through a brick wall to win the game.” They measure a prospect by his engagement level. Does he settle for easy ice on the perimeter or does he drive straight to the greasy areas? If he’s a forward, does he go to the net and fight through the resistance? If he’s a defender, does he eliminate opposing attackers down low? Does he go to the corners and win his share of the 50/50 puck battles? How bad does he want it? ​Shot/scoring touch: Scouts base their assessment on how hard a player shoots, how accurate he is, how quickly he’s able to get the puck off his stick, and his general proficiency in different types of shots (wrister, slapper, backhand). Puckhandling: With time and space whittled to almost nothing by aggressive defensive schemes, the ability to make quick, constructive plays with the puck is critical. “You look for the ability to handle the puck in traffic,” a scout said. 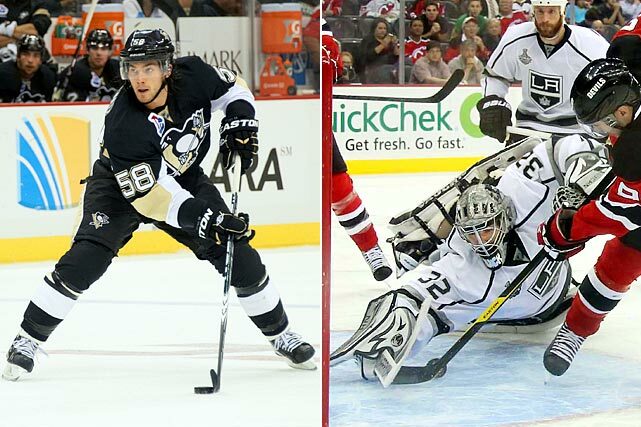 “Can he create space for himself [with puck movement]? Can he handle the puck at top speed?” Scouts also look for a player who can keep his head on a swivel and consistently deliver a quick, accurate pass. Size: Small players may have a growing presence in the game, but not every gifted, undersized player is the next Johnny Gaudreau. History shows that small players are more likely to end up terrorizing the minor leagues than leading the playoffs in scoring like Tyler Johnson. 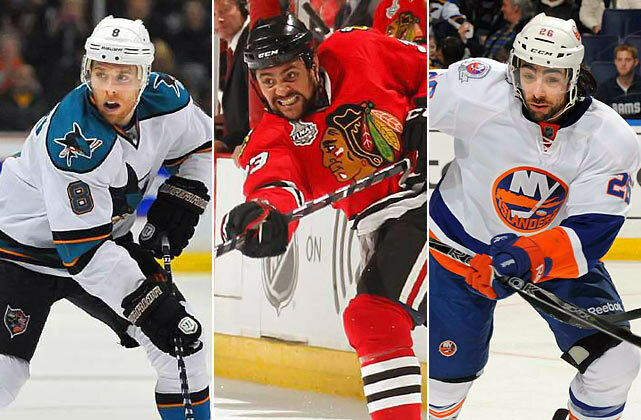 Size enhances the likelihood that a prospect can find a role in the NHL. The 6' 4" winger who can’t translate his junior scoring skills to the NHL might still find success in a depth role. That’s a lot less likely for a smaller player. “There are always going to be exceptions ... guys who play bigger than their size and some who play smaller, too,” a scout told SI.com. 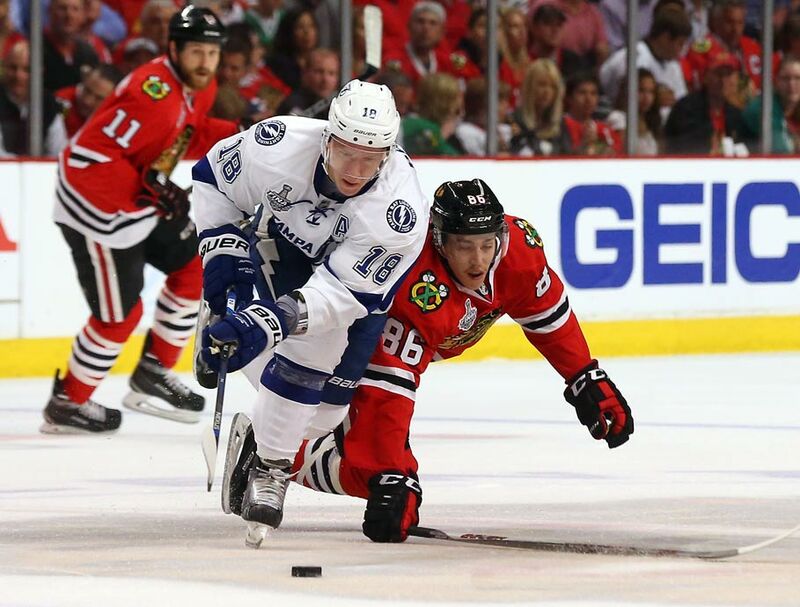 “This is a physically demanding game, especially in the playoffs. A player who is larger and stronger is better equipped to take the punishment ... [and] more likely to make a contribution." Leadership/presence: This one is fairly straightforward. Is the player someone who inspires his teammates? Does he make others around him better? Is he someone the coach relies on in key situations? Can he take control of a game? The Czech winger, a famed member of the Lightning's Triplets line with the undrafted Tyler Johnson and second-rounder Nikita Kucherov, was passed over twice until he was finally selected by Tampa Bay in the seventh round, fourth from last, with the 208th pick. Two years later his impressive rookie season (23 goals, 59 points, +32) made him the runner-up in the Calder Trophy voting. His penalty-killing skills and shutdown abilities were key ingredients of the Bolts’s run to the 2015 Stanley Cup Final. 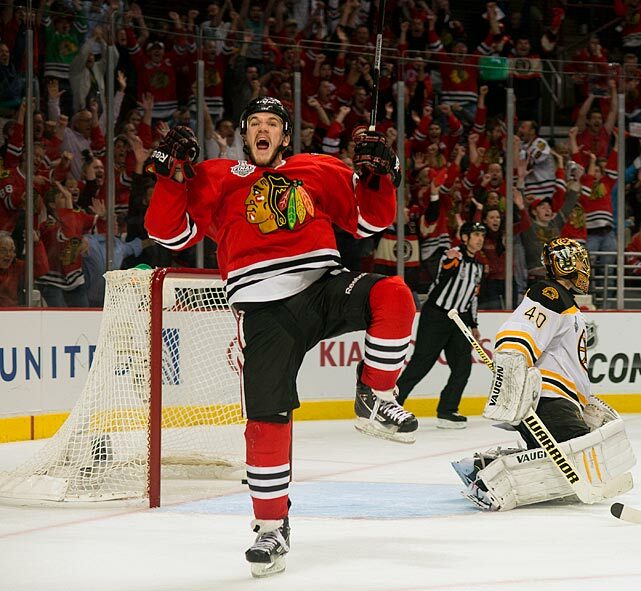 Agitating energy winger Andrew Shaw, a hero of the Blackhawks' run to the 2013 Stanley Cup — particularly their 3-OT win in Game 1 — was passed over in two successive NHL Drafts until Chicago finally took him in the fifth round, 139th overall, in 2011. "Best 19th rounder ever," joked teammate Patrick Kane. 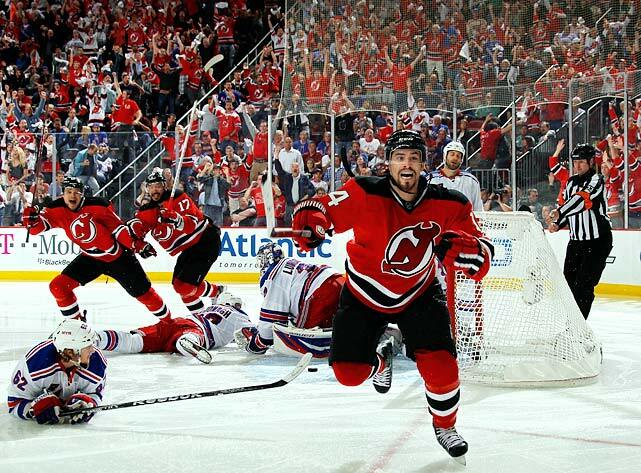 Henrique, a 2012 Calder Trophy nominee who wasn't in the award discussion when the season began, was taken by New Jersey 82nd overall in 2008. Steve Stamkos and Drew Doughty went 1-2 respectively that year. Braden Holtby, the Capitals goaltender who made a splash during the 2012 postseason, was a fourth-rounder, at No. 93. 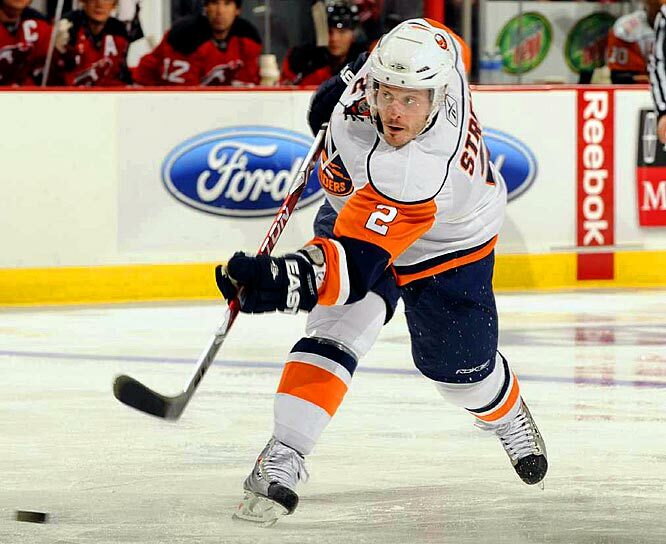 The productive power play specialist was a dark horse pick out of Zurich, Switzerland at 262. Other notables from the year Alex Ovechkin and Evgeni Malkin topped the draft: right wing Ryan Callahan (Rangers, 4th Rd. at 127), right wing Kris Versteeg (Bruins, 5th Rd. at 134) and center Max Talbot (Penguins, 8th Rd. at 234). The '03 draft, led by goalie Marc-Andre Fleury (Penguins, No. 1) yielded several gems. Joe Pavelski, taken by the Sharks at 205, blossomed into a reliable scorer (career-high 41 goals in 2013-14). Dustin Byfuglien (245) went as a defenseman but made his mark as a forward during Chicago's run to the 2010 Stanley Cup before returning to the blue line. Matt Moulson (263) didn't reach the NHL until '07 -- with the Kings -- and was later plucked off the scrap heap by the Islanders in '09. He suddenly produced three successive 30-goal seasons and a 2012 Lady Byng Trophy nomination for his gentlemanly play and sportsmanship. 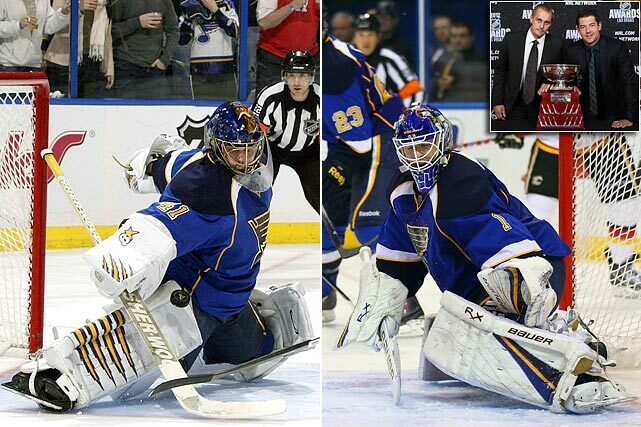 The Blues' 2011-12 Jennings Trophy-winning netminders were taken at 271 and 291 respectively: Elliott was the next-to-last-player chosen in 2003. Halak later shot to stardom with Montreal during the 2010 playoffs, and his status as the undisputed No. 1 in St. Louis was challenged during the 2011-12 season by a strong showing from Elliott, who had played three nondescript seasons in Ottawa and Colorado. The year that starcrossed Rick DiPietro (Islanders) became the first goaltender ever taken No. 1 overall, the Rangers chose one, Brandon Snee, in the fifth round with the 143rd pick. 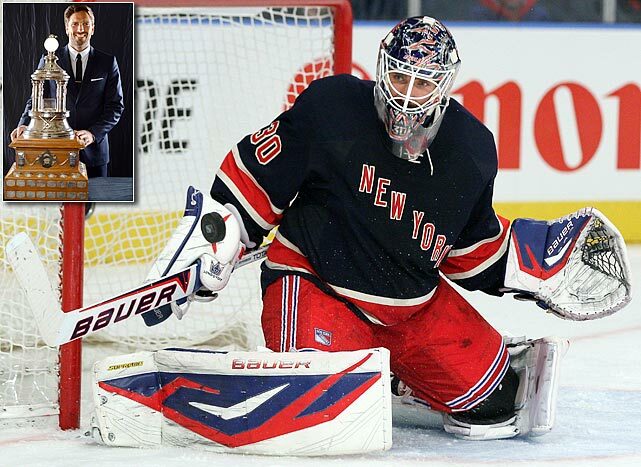 King Henrik, their future three-time All-Star and 2012 Vezina-winner, arrived at 205 out of Vastra Frolunda, Sweden. Some of the other goalies who went before him: Brent Krahn (Flames, 9), Ilya Bryzgalov (Ducks, 44), Mathieu Chouinard (Senators, 45), Dan Ellis (Stars, 60), Mikael Tellqvist (Maple Leafs, 70), Peter Hamerlik (Penguins, 84), Jean-Francois Racine (Maple Leafs, 90), Stefan Liv (Red Wings, 102), Ghyslain Rousseau (Sabres, 111), Levent Szuper (Flames, 116), and Davis Parley (Panthers, 120). Center Patrik Stefan was the Thrashers' overall No. 1 pick (ahead of the Sedin twins at 2 and 3). Brian Finley (Predators, 6th) was the first goalie taken, and he went on to play all of four NHL games. 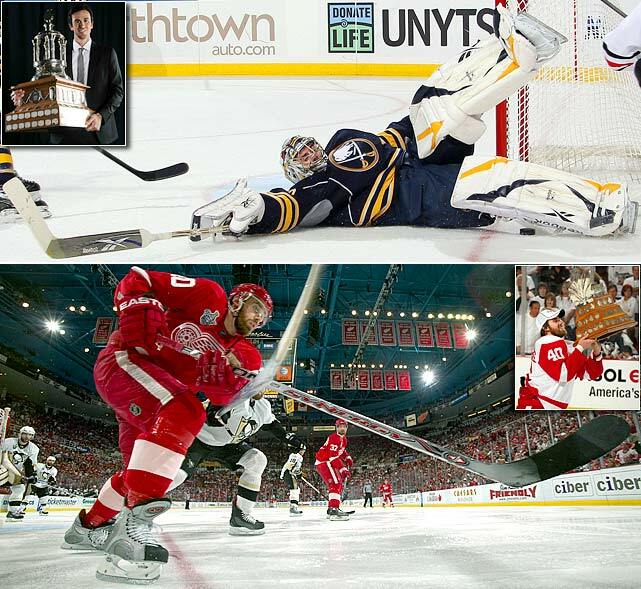 The Sabres lucked into their 2009-10 Vezina-winning All-Star workhorse at No. 138, after a total of 16 netminders were off the board, the best of the bunch being, arguably, journeyman Alex Auld (Panthers, 40). Detroit mainstay Zetterberg, at 210, is just one monument to the Red Wings' ability to mine Sweden for buried gold. Winger Johan Franzen was taken in the third round at No. 97 in 2004. Tomas Holmstrom was a 10th-round pick (257) in 1994. The great Nicklas Lidstrom was plucked in the third round (53) in 1989, well behind such blueline luminaries as Adam Bennett (No. 6), Doug Smolek (7), Jason Herter (8), Jason Marshall (9) and Lindsay Vallis (13). The Lightning took center Vincent Lecavalier first overall and found another piece of their 2004 Stanley Cup championship team in Brad Richards at No. 64. He'd later win the Conn Smythe Trophy for them. (Another key member of that team, winger Martin St. Louis, was an undrafted free agent.) The Red Wings, meanwhile, scored with Pavel Datsuyk out of Yektarinburg, Russia, at 171. He's since been in the conversation regarding the NHL best all-around players, winning four Lady Byng (gentlemanly play) and three Selke (top two-way forward) trophies while earning six successive Selke nominations (2008-2013) as a key member of two Cup teams. 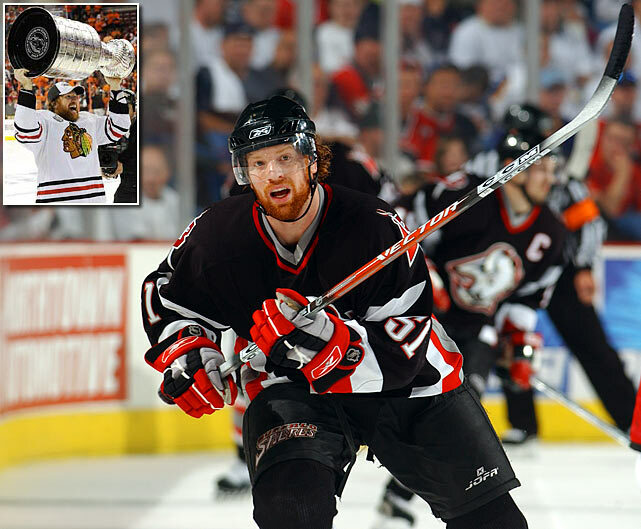 Other notables from '98: Two-time Cup-winning defenseman Rob Scuderi (Penguins, 5th Rd. at No. 134) and RW Chris Neil (Senators, 6th Rd. at No. 161). The offensively gifted, puck-moving defenseman was plucked out of OHL Ottwa at 156 and spent all or part of eight seasons with Buffalo, earning two of his four All-Star Game nods. Signed out of San Jose by Chicago in July 2008, he became a key member of the Blackhawks' 2009-10 Stanley Cup championship team. In 2012, Campbell helped the Florida Panthers snap a 11-year playoff drought and became the first blueliner since Red Kelly in 1954 to win the Lady Byng trophy. The top two picks were defensemen: Chris Phillips by Ottawa at No. 1 followed by Andrei Zyuzin (San Jan Jose). Another 19 blueliners were taken until the Islanders grabbed the towering 6-9 Chara at 56 out of Slovakia's Dukla Tencin Junior team. 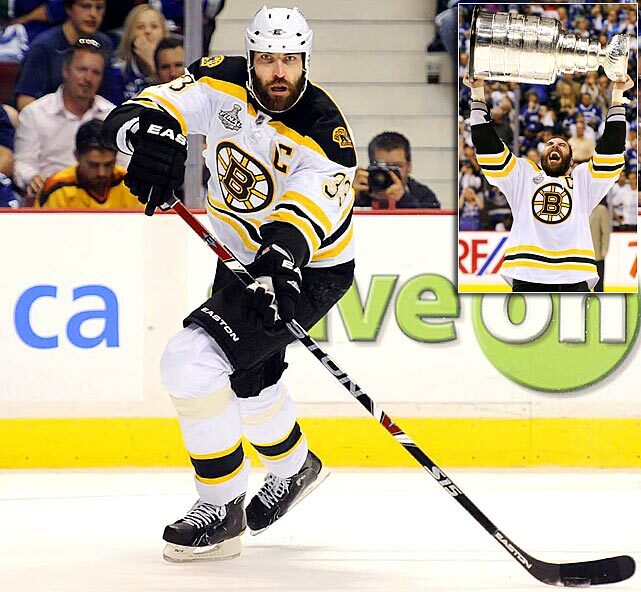 To the Isles' regret, they traded him after four seasons and Chara went on to make six All-Star Game appearances with Ottawa and Boston, win the 2009 Norris Trophy as the NHL's top defenseman, and lead the Bruins to the 2011 Stanley Cup as their captain. Netminders Jean-Sebastien Giguere (Hartford, No. 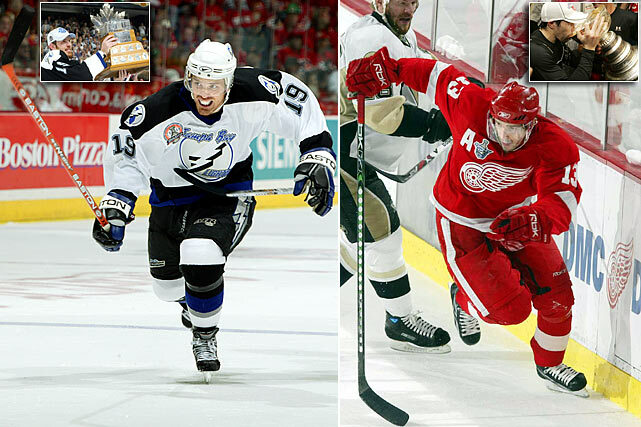 13), Martin Biron (Buffalo, 16), Brian Boucher (Philadelphia, 22) and Marc Denis (Colorado, 25) went in the first round. 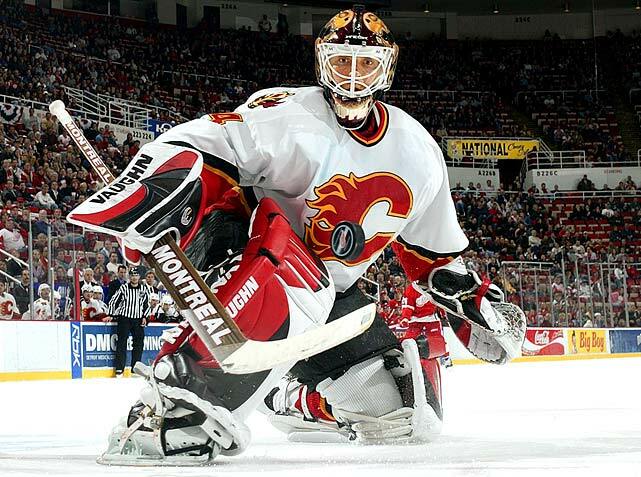 Kiprusoff, at 216 out of TPS Turku, Finland, never got a chance in San Jose, where he was stuck behind Evgeni Nabokov, but when Calgary acquired him in November 2003 trade for a 2005 second-round pick, the Flames landed a cornerstone goalie who would backstop them to the 2004 Stanley Cup Final and win the Vezina in 2005-06. Ottawa's first pick in '94 was center Radek Bonk at No. 3 overall, but they found their now-venerable captain at 133, five rounds later after taking defenseman Stan Neckar (29) and goalie Bryan Masotta (81). 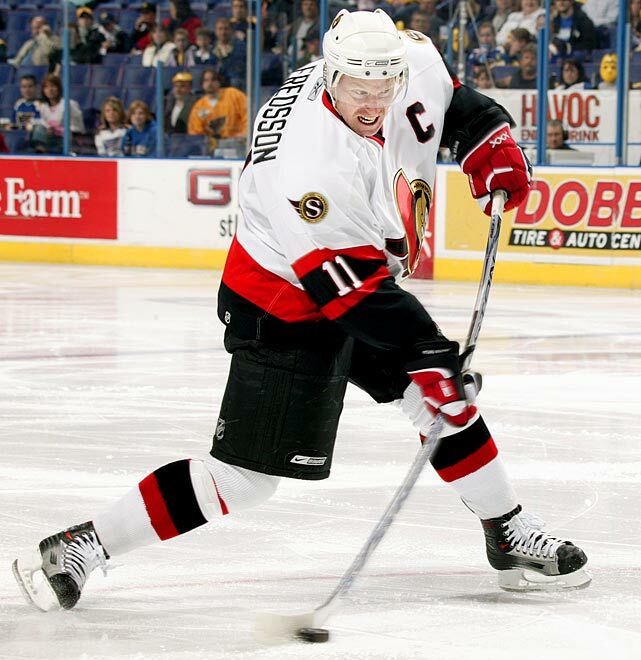 Alfredsson won the Calder Trophy as rookie of the year for 1995-96 and played 17 seasons for the Senators, topping 30 goals in a season four times (including 40+ twice) while making six All-Star Game appearances. He also won the 2012 King Clancy Trophy for leadership and humanitarian work. Other notables from '94: G Tim Thomas (Nordiques, 9th Rd. at 217), G Evgeni Nabokov (Sharks, 9th Rd. at 219) G Tomas Vokoun (Canadiens, 9th Rd. at 226), and G Marty Turco (Stars, 5th Rd. at 124). The Lightning had the first overall pick and used it on defenseman Roman Hamrlik. The goalie who would later backstop them to their 2004 Stanley Cup did not arrive until March 2001 via trade with the Jets/Coyotes for whom he'd toiled for five seasons after being taken at 204. But when Winnipeg chose him out of CSKA Moscow in '92, they landed a four-time All-Star. The first goaltender taken that year: famous flash-in-the-pan Jim Carey (Washington, second round, 32). RW Jere Lehtinen (North Stars, 4th Rd. at 88) went on to win three Selke Trophies as the league's top two-way forward and win the Stanley Cup with Dallas in 1999.